Cruise arrives at Port Everglades 6 hours late. Is this really a news story? 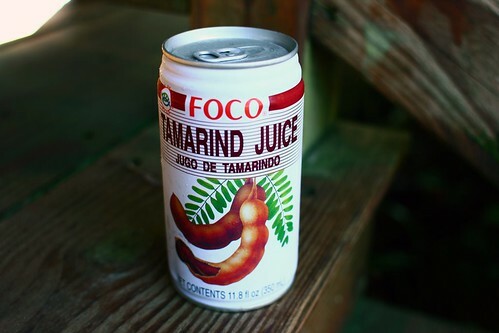 This tamarind juice was delicious, about the consistency of peach nectar. Very sweet, as it should have been — it contains high fructose corn syrup, which, along with the fact that it contains mostly water (30% actual tamarind juice) should have disqualified it from the “Juice” label. Oh well. I bought mine at Fruit and Spice Park, but it’s probably also available at Caribbean markets all over town. Crazy video of the Miami Alleycat bike race. Via Rick to whom: 1) Where did you get the idea that this is a Critical Mass event? and 2) How is it a cyclist’s fault that some pedestrian walks out into the street without looking? Langerado schedule: No excuses, you’re going to have to take Friday off this year. And pack a minimum of three hits of acid per person.